Bonsai is the art of producing and maintaining trees in miniature that evoke in the viewer an image of a towering tree of the forest or an isolated, windswept tree that clings to a cliff over a seashore. The art is centuries old, having its origins in China and Japan. 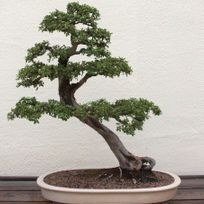 The bonsai tree is not a particular species of tree, but can be produced from many varieties of trees, particularly those varieties of trees with small leaves that will be in scale with the tree's diminutive size. 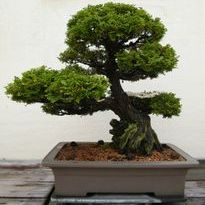 Bonsai are not produced by magical or severe techniques, nor are the trees stunted or tortured. 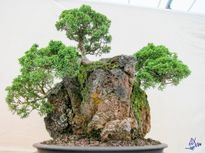 Rather, a combination of shaping, pruning, and trimming with proper care will produce the amazing result called bonsai. Bonsai are often classified by the type of plant material used. 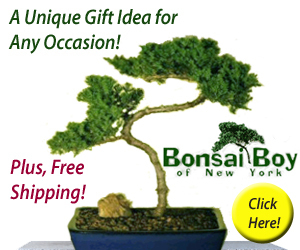 This page discusses three types of bonsai; Coniferous, Tropical/Subtropical, and Deciduous. Conifers are cone bearing evergreen trees. 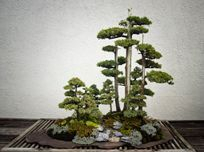 Many conifers make excellent bonsai. These include spruce, pine, juniper, cedar, cypress, hemlock, larch, cryptomeria and many others. Most conifers are very hardy and should be grown outside in all but the coldest weather. WATERING: Proper watering is critical. Feel the surface of the soil every morning. If the soil is fairly moist then you do not need to water. If the soil is only slightly moist then it is time to water. Water from above until the soil is completely soaked. During hot dry weather your tree will need frequent watering. Direct sunlight and wind can cause the soil to dry out rapidly. Very small bonsai in small pots can sometimes dry out in a day or less. Be alert to changing conditions. Allow the soil of your bonsai to dry down between waterings but never allow the soil to become bone dry. LIGHT: As a rule, you cannot overexpose your conifer bonsai to light. However, you can harm it by not giving it enough light. Though most conifers thrive in direct sunlight, a few, like the hinoki cypress adapt well to light shade. LOCATION: Good air circulation and fresh air are essential for the health of your bonsai. Conifers should be grown outside in all but the coldest weather. 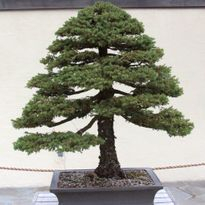 Winter hardy bonsai such as conifers can tolerate very cold temperatures, but cannot tolerate the very cold wind. When night temperatures are consistently below freezing it is time to move your conifer bonsai into a cool or unheated garage, basement, cold frame or very cool room in the house. Remember to regularly check for drying out. Though bonsai use less water in the winter, completely drying out can still be dangerous. When night temperatures are above freezing it is time to move your conifer bonsai back outside. To avoid sun burn, it is best to gradually move your tree from shade to full sun. FERTILIZING: Your bonsai does best with frequent feeding during the growing season (spring, summer and fall). We recommend organic (liquid seaweed, fish emulsion) rather than chemical fertilizers. PEST PREVENTION: Clean your bonsai once or twice a month by removing dead or unhealthy foliage. Be sure to remove the brown foliage around the inner branches. Wash each time you water by running the water through the foliage. Misting is useful when the air is dry as it provides extra moisture and helps keep the foliage clean. Spider mites are a threat to conifers. Hold a white piece of paper under your tree and gently shake the foliage. If there are mites, some will fall onto the paper. If you look very closely, you can see them slowly crawling around. If your tree has mites, treat with an insecticidal soap. Repeat every four days until they are eliminated. If you have a serious infestation, we recommend using a miticide. REPOTTING AND STYLING: Most bonsai need to be repotted every two or three years. 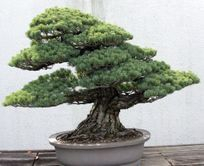 Occasional trimming (and perhaps wiring), will also be necessary to keep your bonsai looking good. When trimming a conifer do not hedge prune. Pinch, or selectively prune unwanted growth. If you need help, we recommend consulting a good book, a bonsai professional, or a competent enthusiast for advice. The tropical belt surrounds the equator. Trees native to this area include: ficus, fukien tea, natal plum, buttonwood, bougainvillea, and many others. Subtropicals are plants native to climates with hot summers and mild winters. These include: serissas, bush cherries, Okinawan hollies, New Zealand tea trees, catlin elms and many others. 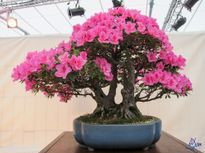 Both tropical and subtropical bonsai are well suited to growing indoors. WATERING: As a rule follow the same watering techniques as described above for conifers. There are a few exceptions, a few like ficus and bougainvillea like to dry out completely between waterings. Some succulents like to dry out for several days. Most, however, do not like their soil to become bone dry. TEMPERATURE: Tropical and Subtropical bonsai thrive in hot humid climates. Tropicals are at their best during the summer when temperatures are above 75 degrees F. In the winter, Tropical bonsai, do best between 65 - 75 degrees F. Subtropical bonsai prefer temperatures between 45 - 65 degrees F. Freezing or near freezing temperatures should always be avoided. LIGHT: Most tropical and subtropical bonsai need to be grown in very good light. If you can, put your bonsai outdoors in the summer. Subtropical bonsai may be put out in late spring and left until fall. Light shade, filtered sun or morning sun is acceptable for most varieties. When indoors keep your bonsai in a window or very close to one. If you cannot provide enough light in the winter, we suggest supplementing with grow lights. FRESH AIR: Air circulation is very important, so open the window on warm days. When you cannot open windows, we suggest using a fan for several hours a day. Keep your bonsai away from cold drafts and heat sources. FERTILIZING: Your tropical or subtropical bonsai does best with frequent feeding during the growing season (spring, summer, and fall). We recommend organic rather than chemical fertilizers. PEST PREVENTION: Follow the same directions for pest prevention as listed above for conifers. Tropical and subtropical bonsai can suffer from pests which do not plague conifers. If you are unsure about what kind of pest you have, take a sample to your local garden center and they will recommend the proper insecticide. REPOTTING AND STYLING: Follow the same directions as listed for conifers. Styling bonsai is an art form. Each plant is unique and should be pruned to the shape you desire. Consult a good book or a professional for design tips. Deciduous trees are those which drop their leaves every autumn, remain dormant through the winter and leaf out again in the spring. 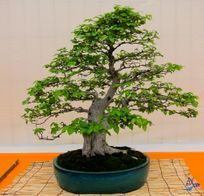 Deciduous trees make very desirable bonsai with their brilliant fall colors, striking silhouettes during the winter and lush foliage during the growing season. 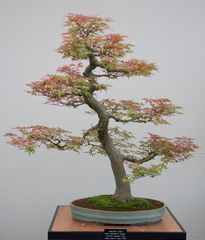 Varieties include: Japanese maple, trident maple, Chinese elm, beech, hornbeam, crabapple, ginkgo and many others. WATERING: Watering techniques for deciduous bonsai are the same as listed above. LIGHT: Deciduous trees need to be grown outdoors in very good light. Hot sun and wind can cause leaf burn, so you may need to provide some shade from the midday sun during the hottest months. LOCATION: Good air circulation and fresh air are essential for the health of your trees. Deciduous trees must be grown outside from spring to fall. When night temperatures are consistenly below freezing you should move your deciduous bonsai into a protected, unheated location like a garage, basement or cold frame. Some people even put their smaller trees in the refrigerator. Temperatures between 30 0 40 degrees F. are ideal. Under these conditions your bonsai will be dormant and will not need light, however, you must not forget to check for water. Even though dormant trees use very little water, drying out completely can still be dangerous. Watch the new buds closely in late winter/early spring. When the buds begin to swell, your deciduous bonsai has begun to grow. You must now move it to a location where the temperature stays above 35 degrees F., and the light is very good. When frost danger is over it is time to move your tree back outdoors. FERTILIZING: Fertilizer recommendations are the same as for conifers, tropical and subtropical bonsai. PEST & DISEASE PREVENTION: The young shoots of deciduous bonsai are especially tasty to aphids. If you detect these tiny sucking insects, you must blast them off with a hard spray of water and apply a mild insecticidal soap. If you detect insects or other problems that you are unable to remedy, we suggest you consult with a garden center professional. REPOTTING AND STYLING: Again, follow the same guidelines for trimming and styling your deciduous bonsai as mentioned above. Remember to enjoy this activity as it is the styling of your bonsai that results in a one-of-a-kind living work of art.